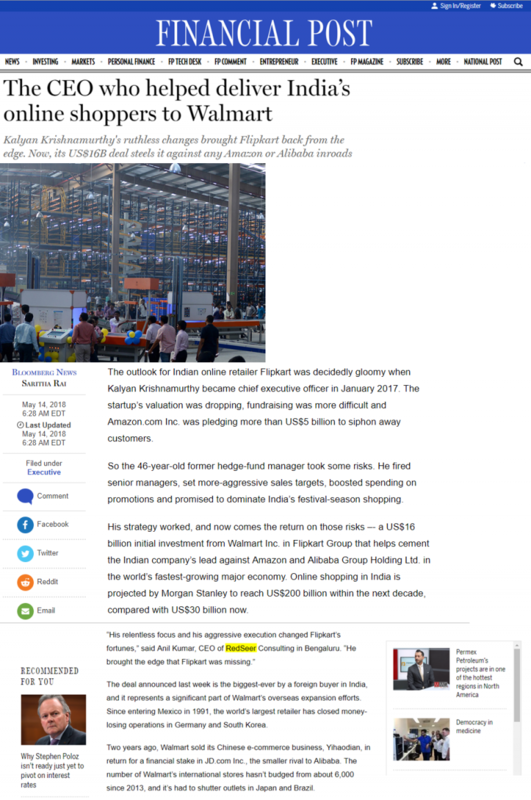 The outlook for Indian online retailer Flipkart was decidedly gloomy when Kalyan Krishnamurthy became chief executive officer in January 2017. The startup’s valuation was dropping, fundraising was more difficult and Amazon.com Inc. was pledging more than US$5 billion to siphon away customers. His strategy worked, and now comes the return on those risks –- a US$16 billion initial investment from Walmart Inc. in Flipkart Group that helps cement the Indian company’s lead against Amazon and Alibaba Group Holding Ltd. in the world’s fastest-growing major economy. Online shopping in India is projected by Morgan Stanley to reach US$200 billion within the next decade, compared with US$30 billion now. The deal announced last week is the biggest-ever by a foreign buyer in India, and it represents a significant part of Walmart’s overseas expansion efforts. Since entering Mexico in 1991, the world’s largest retailer has closed money-losing operations in Germany and South Korea.